Excellent supportive staff. Minor problems with English, but they solved everything. 16th executive floor, 3 adults family. There was a bit too cold in the room when we arrived, but they arranged an additional heater and quilts. There were two kind of pillows, soft and normal. The breakfast has huge selection including Asian and European food. They were very polite and helpful. Taxi calling to the airport also went well. One of the best hotel I have ever been. The staff ( Jason) was very helpful in giving directions as how to take airport shuttle to the nearest stop( 方庄) and then take a cab to the hotel, thus saving us a lot of cab fair! Jason also made sure the cab we hired outside your hotel is safe to ride by talking to the cab driver before the driver took us to the airport. The check in staff were friendly and helpful too. One waiter in the noodle shop was kind enough to let us borrow a steak knife so we could cut the fresh fruits in our room. The staff who took our luggage for storage and the staff who retrieved the luggage for us were all nice and courteous. They all made us feel like at home( 賓至如歸). The bed was clean and confortable. The bathroom was clean. The breakfast was ok.
within walking distance temple of heaven zone, extremely attentive staff, especially front desk personnel, they are micheal and alan, spacious rooms, comfy mattress and pillow options available inside, well designed buffet breakfast meets world wide requests. indoor heated swimming pool, spa, steam room, hot tube, sauna and gym are valuable extras for athletes. Has ATM and Money Exchange Terminal. 10 mins walk from Subway. Good to stay overnight, if you want to catch the early morning trains from Beijing South Railway Station. The breakfast is great. Make sure you bring a swim cap for the indoor pool, the hotel has them for 98 RMB, we found one for 6 RMB (1/13th the price) off site. I was not impressed. I had some small problems but the manager Mr. Michael was able to rectify the situation. I was very impressed with the breakfast and general professionalism of the staff. Swimming pool was clean and it was a huge event to have alone time in a pool in such a big city! Enjoying easy access to Beijing's commercial and business districts, Holiday Inn Temple of Heaven offers free Wi-Fi and an indoor pool. It is a 20-minute walk from the famous Temple of Heaven. 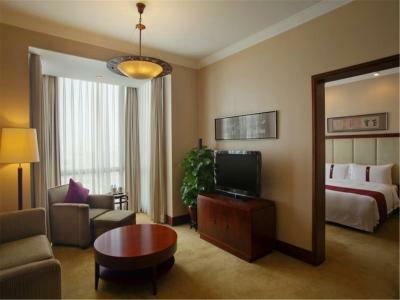 Holiday Inn Temple of Heaven Beijing is a 20-minute drive from Wangfujing Shopping Area. Beijing Capital International Airport is a 40-minute drive from the hotel. 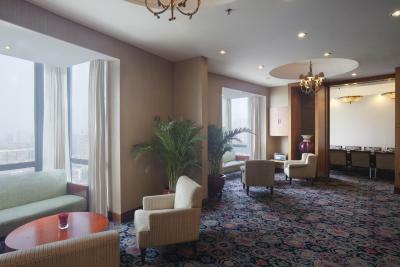 Elegantly decorated, the air conditioned rooms enjoy 24-hour room service and views of the city. A cable/satellite TV, minibar and personal safe can be enjoyed in all rooms. Guests may exercise at the hotel's fitness center or relax with a massage at the rooftop garden. The hotel also provides concierge services and a business center with full secretarial services. The 3 on-site restaurants serve a selection of Cantonese cuisine, Asian dishes and an international buffet spread. Coffee and cocktails can be enjoyed at the stylish Echo Lounge. Fengtai is a great choice for travelers interested in convenient public transportation, ancient landmarks and tourist attractions. When would you like to stay at Holiday Inn Temple Of Heaven Beijing? Room offers a bathroom with bathtub and separate shower facilities. Features panoramic city views from the 15th floor and Club Lounge benefits like free cocktails and evening snacks. Check email with complimentary high-speed Internet from the comfort of your sophisticated Guest room. Enjoy complimentary coffee and tea as you watch satellite channels on TV. This room includes Executive Lounge access and benefits, like free breakfast and evening cocktails. Located on the 1st to the 3rd floors, this twin/double room features air conditioning, satellite TV and mini-bar. This friendly hotel's convenient location between the South 2nd Ring and 3rd Ring roads puts you 15 minutes by taxi from Beijing South Railway Station, and 20 minutes from both the Yizhuang Technological Development Area and Wangfujing. Beijing Capital International Airport is 40 minutes by taxi from the hotel. It is only 10 minutes by walk to the nearby Metro and 20 minutes stroll to The Temple of Heaven. Holiday Inn Beijing Temple of Heaven has complimentary wireless Internet in our air-conditioned public areas and 11 modern meeting rooms where you can host events for up to 350 people. The Business Centre supports your printing, faxing and secretarial needs. Enjoy complimentary breakfast and evening happy hour in our Executive Lounge when you stay in an executive room or suite. 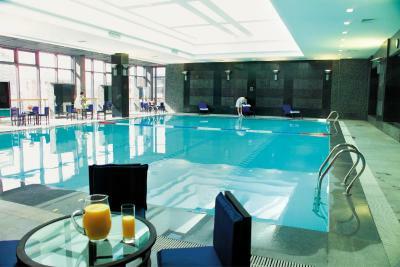 Take a refreshing dip in our indoor swimming pool and work out in the Fitness Centre. The Temple of Heaven, one of Beijing's most famous landmarks, is just a 20-minute stroll from your hotel. With 3 restaurants serving Cantonese cuisine, noodles and international buffets, dining is a pleasure at Holiday Inn Beijing Temple of Heaven. You can also relax in the stylish Echo Lounge with coffee or cocktails. House Rules Holiday Inn Temple Of Heaven Beijing takes special requests – add in the next step! One older child or adult is charged CNY 280 per person per night in an extra bed. Greatwall Peony Dragon Pacific Jin Holiday Inn Temple Of Heaven Beijing accepts these cards and reserves the right to temporarily hold an amount prior to arrival. Holiday Inn Temple Of Heaven Beijing accepts these cards and reserves the right to temporarily hold an amount prior to arrival. This hotel needs definitely a renovation. It is only 3 stars. On Monday morning you have to start to the airport by taxi earlier than they suggest. There was big rush on the road. It was dangerous to late our plane. internet connection was a problem at all, you need to spend at least 20 mins to get landing page if the servers are originated from the usa or europe. i thought that it was not hotel's fault probably based on government policy. it's almost impossible not only log into instant messaging portals but also display live streaming on tv channels. Location is great, WiFi is fast. Staff are very friendly and helpful. Room is clean, family friendly. I can't seem to think of anything. Parts of hotel old and dirty. Wi-fi in this Hotel does not allow Whatsapp. Poor English speaking staff. It took us a while and repeatedly speaking to restaurant & front desk to get a ala-cartte breakfast packed for travel. Ask for additional Deposit, while checking-in. my friend arrived later than me and my welcome drink ,did not cover the later arrival. basic thing. !